It is with great sadness that the family announces the passing of Wade Peterson on Wednesday, January 30, 2019 at his residence. Wade was born on July 13, 1957 at Shaunavon to Chester and Evelyn (nee Hansen) Peterson. He grew up in nearby Simmie and attended Simmie School. Wade helped on the family farm and had a variety of jobs right out of school. At 19 years old, he ventured to Lanigan and started working at the Potash Mine. He was hired as a general labourer and eventually was able to apprentice and obtain his Journeyperson Industrial Mechanic Certificate. Wade’s career spanned 40 ½ years with his retirement on June 1, 2017. On August 11, 2001, Wade married Donna Yaworski. Together they were able to enjoy spending time at their cabin at Lucien Lake and their place in Arizona. Wade enjoyed fishing and was able to check salmon fishing in BC off of his bucket list this past summer. He loved to golf and was a regular at men’s night. 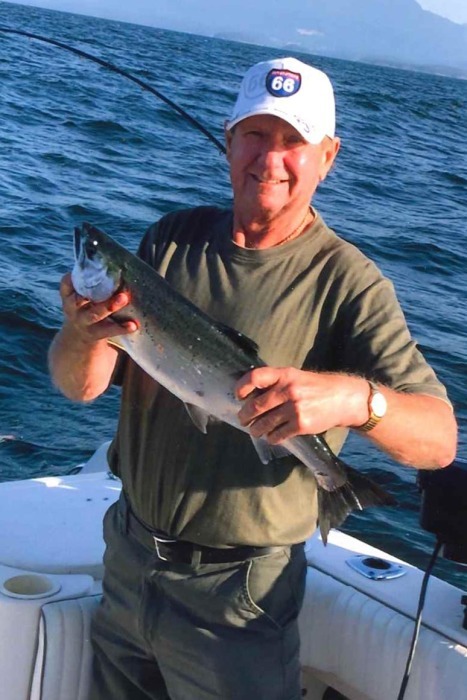 He spent many hours with his best friend Gary Kopperud, whether golfing, sitting on the deck or whatever else they might find to do, they were always together. Wade enjoyed hunting and then making salami and smoking sausage to share with friends. He was an excellent cook and baker as well. Wade loved socializing with family, friends and neighbors. He was a huge Saskatchewan Roughrider fan and had a large collection of memorabilia. Not one to sit still, he was always “putzing” in his garage, building and fixing things. Wade volunteered with the Lanigan Volunteer Fire Department for a number of years. Above all, Wade was extremely proud of his two daughters, Haley and Brette, and was always happy to be able to spend time with them. After his marriage to Donna, he took on the role of being a great step dad to her children, Tandi and Robin. Wade simply adored his three granddaughters and was so proud to be a grandpa to these wonderful girls. Wade will be lovingly remembered and sadly missed by his wife of 17 years, Donna Peterson; daughter Haley Renwick (husband, Kyle and daughters Finlee and Bryer); daughter Brette Wilkinson (husband, Jamie); stepdaughter Tandi Mkangwana (her daughter Neveah Fitzpatrick); stepson Robin Mkangwana; brother Darryl (Rita) Peterson; sisters Valli Blyth and Myrna Hoisington; sister-in-law Sue Peterson; father-in-law August Yaworski; and by numerous nieces and nephews. Wade was predeceased by his parents Chester and Evelyn Peterson; brother Lorrel Peterson; brothers-in-law Ken Blyth and Dennis Hoisington; and mother-in-law Evelyn Yaworski. In keeping with Wade’s wishes, there will be no public services. Memorial donations in Wade’s memory may be directed to Lanigan Golf Course, with donations payable to Town of Lanigan Box 280 Lanigan, SK S0K 2M0. Wade’s family would especially like to thank Dr. Akinjobi, home care nurse Pam Monchuk and pharmacist Melissa Brenner for the excellent care given to him throughout his illness.